Image from xkcd.com To so many people, their computer and technological affiliations are becoming a way of life, a basis for their identity. Mac vs. PC vs. *nix/*BSD, Internet Explorer vs. Firefox vs. Opera. It’s not about the quality of the technology, it’s about making oneself feel superior through the competition of technology. 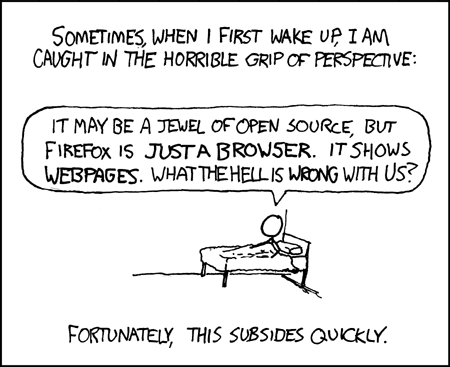 We, as … Continue reading Is Firefox just a browser?